ADDIS ABABA, Ethiopia, Apr 11 2016 (IPS) – The Ethiopian government’s most serious domestic political crisis in more than a decade began over a scruffy football field appropriated by local officials for development. After students responded by taking to the streets of Ginchi, a small town 80km from the capital, Addis Ababa, their protest was quickly quelled. But a spark had been lit for what has turned into an outpouring of grievances by the Oromo—Ethiopia’s largest ethnic group, accounting for about a third of the country’s 95 million population. As protests spread, they ostensibly focused on a plan to expand the Ethiopian capital’s city limits into Oromia—the largest of the federal republic’s nine regional states and two city states—which encircles Addis Ababa. Land in Ethiopia—all of which is government owned—has become an increasingly contentious issue as Ethiopia has opened up to the world, reflecting a worldwide trend particularly effecting developing countries such as Ethiopia. Globally, investors are increasingly looking to investments not linked to volatile equities and bonds: other countries’ land. And few have attracted as much attention as Ethiopia, with its lowlands watered by the tributaries of the Blue Nile, a particularly bountiful draw. The Ethiopian government has been on the front foot and quick to respond to such interest, and since around 2009 has leased about 2.5 million hectares to more than 50 foreign investors, from the likes of India, Turkey, Pakistan, China, Sudan and Saudi Arabia. The so-called Addis Ababa Integrated Development Master Plan was seen as fitting a disturbing trend by the Oromo—many of whom are smallholder farmers—and they weren’t having any more of it. Many observers in Ethiopia, local and foreigners alike, note that although protests have taken an ethnic-based identity and focused on land, other deeper issues behind them—corruption, unfair elections, political and socioeconomic marginalisation—are familiar to many disenchanted Ethiopian voters. Numbers of those killed since November given by international rights organisations, activists and observers range from 80 to 250-plus. Some Addis Ababa residents suggest such numbers are preferable to even higher numbers if the government lost control of a situation that could, they argue, spiral into anarchy. For against the narrative of a typically brutal Ethiopian government crackdown that brooks no dissent, there have been reports of looting, and organised armed gangs attacking foreign-owned factories, and private and governmental buildings. Even churches were damaged during a particularly violent flare up in the south in February. Ethiopian citizens had a right to question the master plan but protests were hijacked by people looking to incite violence, according to Getachew Reda, a government spokesperson. “You shouldn’t define a largely peaceful movement by this,” says a security analyst who focuses on Ethiopia for an Africa-based research organisation. Despite February’s trouble in the south, many observers in Ethiopia say the majority of protests were peaceful, involving Oromo from across the demographic spectrum airing widely held grievances. “People have a perception of lack of competence in governance on the ground,” Daniel adds. The government heeded the call of the people, according to Getachew, and observers say the government deserves credit for listening about the master plan. But, more importantly, these same observers add, the government must allow Ethiopians to exercise their constitutional right to protest, and handle events in a way that does not escalate. 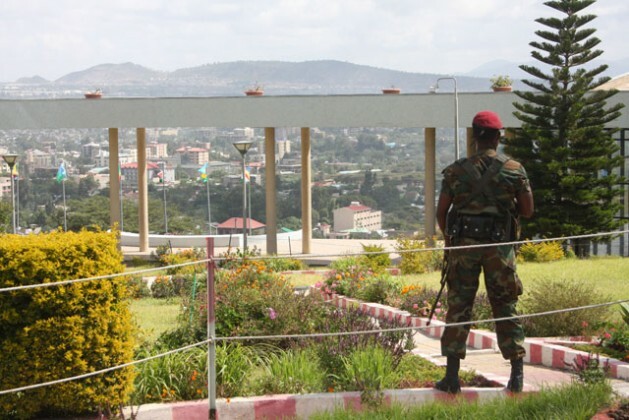 Protests have often resulted in deployment of military forces to support federal police, both regularly accused of ruthless suppression, with the perceived unaccountability of Ethiopia’s security forces added to the list of grievances, the analyst says. There have even been reports of police taking head shots and shooting people in the back. But such alleged actions by police in remote locations, with backup often hundreds of miles away, defy logic as they would result in such a ferocious backlash by the local populace, according to a foreign politico in Addis Ababa. This individual also suggested that some local militia, ostensibly part of state security but who sided with protestors and turned against federal forces, fired from behind women and children at police. Numbers of state security forces killed haven’t been released. Nevertheless, shooting at protesters, as well as arbitrary arrests, especially of students—who initially formed the body of protests—have a long track record in Ethiopia, preceding this government back to during the brutal military dictatorship that ruled between 1974 and 1991. Many who fled that period now compose part of the large Ethiopian diaspora, with the government claiming foreign-based opposition bolstered by US-based social media activists is manipulating the situation to its own ends. “The diaspora magnifies news of what is happening, yes, but no matter how much it agitates it cannot direct at village level in Ethiopia—this is about dissatisfaction,” says Jawar Mohammed, executive director of US-based broadcaster Oromia Media Network, strongly criticised by the government and some non-government observers for fomenting conflict. Imprisonment of leaders of the Oromo Federalist Congress party, Oromia’s largest legally registered political party, along with thousands of other Oromo political prisoners, makes negotiating a lasting solution a tall order, Jawar says. Governance in today’s Federal Democratic Republic of Ethiopia—to use its full title—exhibits an inherent tension. A decentralised system of ethnic federalism jars with the Ethiopian People’s Revolutionary Democratic Front ruling party’s authoritarian one-party developmental state style of leadership, similar to China’s. “The political space has increasingly narrowed, becoming uneven, non-competitive and unwelcoming…contrary to the diversity of desires and interests in Ethiopian society,” states the same editorial. It is a long way from the heady hopeful days of Ethiopia’s new federal constitution after the overthrow of the military dictatorship in 1991. The analyst acknowledges the government deserves credit for creating a constitution that is the best fit for an ethnically diverse country like Ethiopia, and for expanding basic services, infrastructure, respecting different cultural and ethnic identities, and better integrating Ethiopia’s large Muslim population. But, the analyst adds, this federal constitution espouses a liberal philosophy that the government appears unable to reconcile with its decision-making processes. The government’s hitherto successful job of holding together this particularly heterogeneous federation is not about to crumble tomorrow, observers note. But things may get worse before they get better, unless underlying sources of friction and frustration are addressed. The government has since acknowledged there was insufficient consultation with those likely to be effected by the master plan. And during his latest six-monthly performance report to Parliament in March, Prime Minister Hailemariam Desalegn apologised to those who lost family members during protests, while the government has suggested there will be investigations into allegations of police brutality. What is happening in Ethiopia could be a foretaste of what is to come elsewhere, as forces of global markets—including a growing global urban population in more developed nations that eats more than it farms—clash with indigenous desires to protect historical homelands.